The blackened skeletons of scorched trees jut out of the smoldering Earth like angry bee stings. A smell of ash, dust, and death hangs in the air. This isn’t a scene from a post apocalyptic movie. It’s part of a Tasmanian World Heritage Site that harbors some of the oldest trees on Earth. An island the size of Ireland with a population of 500,000, it’s easy to forget about Tasmania, located just 1600 miles from the Antarctic coast. But this tiny slip of rugged terrain is an ecological wonder. Geographic variation and isolation have colluded to create a stunning diversity of ecosystems, from evergreen eucalyptus forests to alpine heathlands to temperate rainforests. On the island’s cool, wet mountaintops, 1,500 year old trees carry a genetic legacy connecting Tasmania to the ancient supercontinent of Gondwana. Now, patches of this planetary heritage are going up in smoke, thanks to a devastating fire season that many experts say could portend the future. 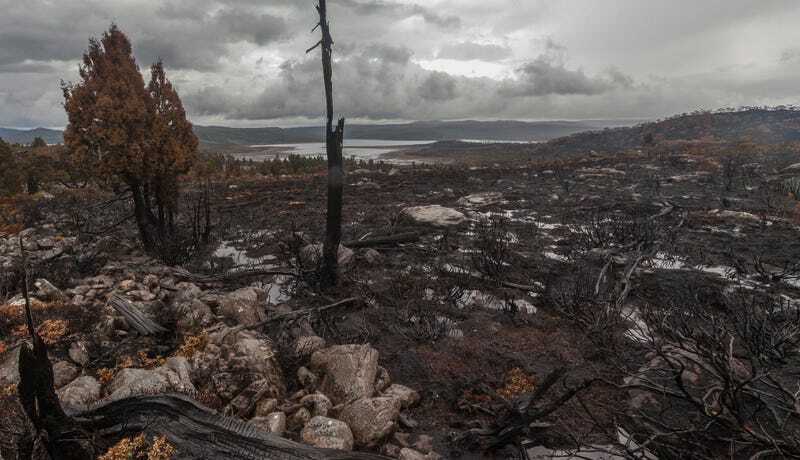 Since mid January, out-of-control bushfires sparked by lightning storms have raged across Tasmania’s World Heritage Wilderness Area. The Tasmanian Fire Service, unaccustomed to tackling dozens of wildfires at once in remote locales, is finding itself outmatched. While authorities focus on suppressing the blazes that pose the biggest risk to humans and property, many wild areas are being left to burn. As of last week, over 25,000 acres of land—roughly 2 percent of the World Heritage Area—had been torched. ABC Online reports that the Tasmanian fire service is gearing up for another month of bushfire operations, but it expects that remote areas could continue to burn for weeks to come. The factors behind this horrific fire season are complex. As in many parts of the world, Tasmania’s normal rainfall patterns are being disrupted by the largest El Niño event on record, which kept spring rains at bay and brought hot, dry weather to the state this summer. The effects of El Niño are compounded by a positive Indian Ocean Dipole event, in which abnormally cool waters in the eastern Indian Ocean produce drier weather in neighboring countries like Indonesia and Australia. But as an ecologist, Bowman sees this exceptional summer in a broader context. From unprecedented heat waves in the southeast to a spate of devastating fires across the Australian alps to record high temperatures around the world, what’s happening in Tasmania is a microcosm of what’s happening to our planet. Michael Grose, a climate scientist with the Australian national science agency, cautioned that scientists haven’t yet directly attributed this bizarre year to human-caused warming. But he agreed that recent events in Tasmania are consistent with what we expect climate change to bring to the state—namely, hotter, drier weather. And that makes him very worried. But as bleak at this sounds, acknowledging the fiery future may be the best thing Tasmanian land managers can do to protect the remaining wilderness. “If the people running the World Heritage Area identified it as an area at-risk to climate change, that reframes the debate,” Bowman said. Right now, there’s almost nothing the Tasmanian Fire Service can do about the remote wildfires, many of which are burning through carbon-rich peat underground. But by bringing in more firefighting resources, increasing drone and satellite surveillance, and using controlled burns to reduce the amount of fuel on the ground, the government could help prevent catastrophic situations from developing in the future. Scientists say Tasmania also needs to be thinking about how to preserve its ecological legacy in the event of a total system collapse. “The final option is to salvage the biodiversity and put it somewhere else,” Bowman said. Fortunately, the Tasmanian Seed Conservation Centre, which stores seeds for numerous endemic species, was built for exactly this purpose. “For restoration and revegetation efforts you generally require larger numbers,” Seed Conservation Centre director James Wood told Gizmodo in an email. But the collections are large enough to at least maintain the genetic heritage of many species. This year, Wood and his colleagues made their first collection of Huon pine, a very slow-growing conifer restricted to the valleys of Tasmania’s wet temperate rainforests. The species has weathered several ice ages, and high on the slopes of Mount Read, a small stand is reputed to be 10,000 years old. If its soils are burned away by fires, these ancient trees may not be able to hang on much longer.